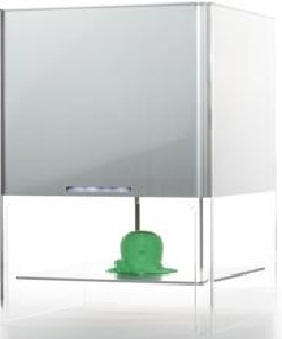 Pirate3D has revealed its zen-inspired and ultra-minimalistic designed 3D printer, the Buccaneer. This flagship 3D printer has no buttons. The front facade has a monolithic aluminum face with a single indicator light, encased within a polished acrylic housing. In addition, it connects wirelessly to mobile computing devices like smartphones or webpads. Pirate3D says it went against traditional spool-design and introduced the revolutionary central-feeding cartridge. The company’s patent-pending design is a top-loading cartridge with central-feeding so that it is easy to handle and load/unload for printing. The device also incorporates a filter in the rear which greatly minimizes odours from the printing process. The Buccaneer has a small footprint of 25cm by 25cm, but the 3D printer boasts a 150mm by 100mm by 120mm print area. It uses the Fused Filament Fabrication (FFF) process, which is similar to other consumer 3D printers on the market.